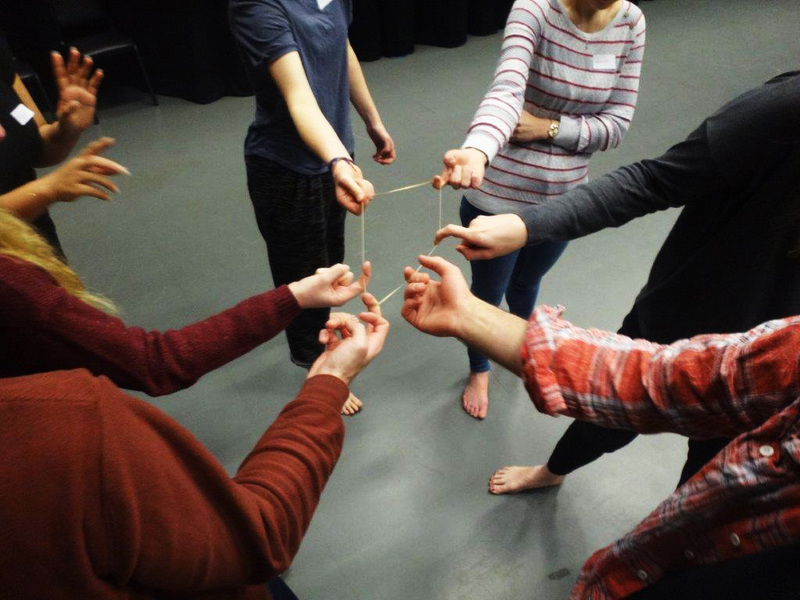 Architecture & Movement Workshop: Materials, Dynamics, Atmospheres. Students from Unit 1 of the MArch course at Kent School of Architecture and MA Physical Acting from the School of Arts worked together to explore materials, dynamics and atmospheres. Welcoming each other into their respective studio spaces, the students examined intersections between their fields, and gathered inspiration for their upcoming performance- and design assessments. This pilot workshop is the first of a series of cross-disciplinary exchanges between two crafts concerned with how the social human being inhabits space. Implications of materials: discovering the characteristics of certain materials, their ‘poetic essence’ – what the material itself has to offer. When the opportunity of going to Lesvos to work as a volunteer came up I did not hesitate to take part. I got involved with the Lesvos Falafel Project (http://www.lesbosfalafel.com/ ) through Leopold from BUREAU A (http://www.a-bureau.com/), an Architecture firm I had been working with during September in Lisbon. 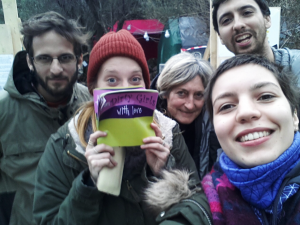 Their approach is very refreshing and different from the excessive formality we experience here in England, thus I knew the Lesvos Falafel Project would be something thrilling and interesting to be part of. The lessons I learnt throughout the week I spent with the Falafel Crew and the NBK (No Border Kitchen) people – our allies – were life changing and covered a range of aspects from politics to architecture to cultural differences. This was a very humanizing and extraordinarily enriching experience. Architecture had a big role to play in this situation. An experience like this helps you open your eyes to the power we have in our hands to change things and to help us define aims for our generation. We cannot sit in the studio all day keeping our eyes shut to the rest of the world, we need to put ourselves out there to have new experiences otherwise architecture is really pointless and rather repetitive. Existentialism is perfectly adapted to Architecture, and, in my opinion, Architecture turns out to be a catalyst for Existentialism. I had been wondering about the irrationality and amorality of this Universe as well as the significance of being human ever since I have read ‘The Stranger’ by Albert Camus, 4 years ago. Now it seems clear that although we live in it at least we, as individuals, made up realities that allow us to walk through life. Architecture plays a big role in this, it helps us advancing and not only teaches us about life itself it also teaches us about ourselves as individuals in a broader context. Our group consisted of young empathetic energetic people with ages ranging from 20 to 70 years old from different areas of interest: Chiara Banchini, the sassiest violinist I have ever met, Leo Banchini, my good friend and visionary with a great love for picking on Portuguese dishes, Silvia Converso, the mother and centre of the group, Jeremy Schuh, our Chef and self-employed organic farmer, Jacopo Corsini, the meat lover with the coolest sense of humour, Louis Mejean and Pierre Cauderay (http://www.aazar.ch/accueil.html), our ‘shower and bath architects’ with a lot of energy and a very decent pair of muscles. We have extra team members that stayed in Lesvos for a month: Julie Melichar and Justine Boillat working in Partnership with other camps amongst which were Moria (UN Camp) and Skala (Lighthouse Camp). Rik, Lulu and our kind workshop Greek Man have done great contributions toward the project. In order to incorporate all the experiences and important topics that connect to architecture I will be composing a series of ‘entries’ that can be published weekly. So keep an eye on the KSA Blog First Entry will come soon! 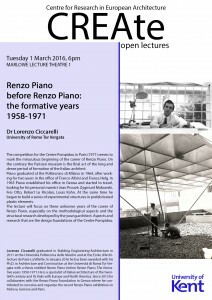 The next CREAte Open Lecture will be given by Dr Lorenzo Ciccarelli on Tuesday 1st March at 6PM in MLT1. The competition for the Centre Pompidou in Paris (1971) seems to mark the miraculous beginning of the career of Renzo Piano. On the contrary the Parisian museum is the final act of the long and dense period of formation of the Italian architect. Piano graduated at the Politecnico di Milano in 1964, after working for two years in the office of Franco Albini and Franca Helg. 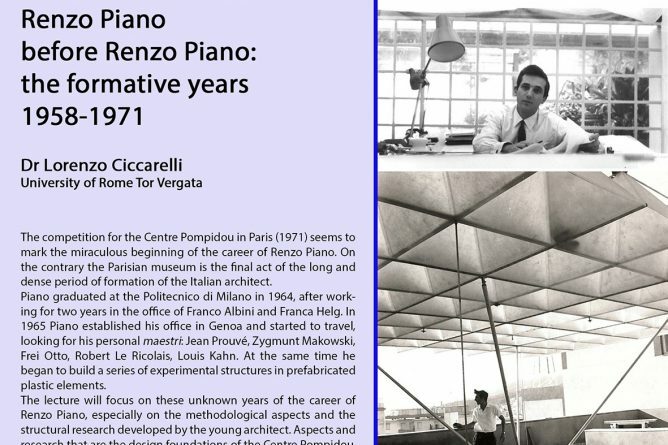 In 1965 Piano established his office in Genoa and started to travel, looking for his personal maestri: Jean Prouvé, Zygmunt Makowski, Frei Otto, Robert Le Ricolais, Louis Kahn. At the same time he began to build a series of experimental structures in prefabricated plastic elements. 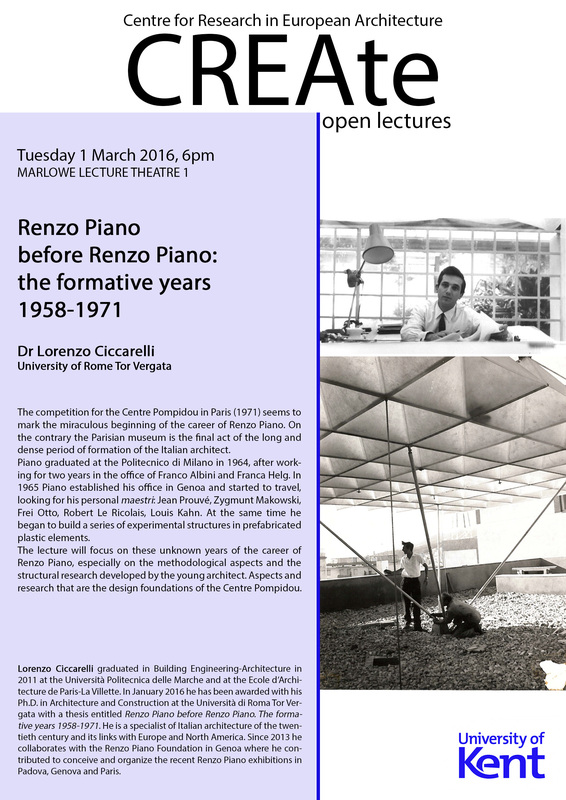 The lecture will focus on these unknown years of the career of Renzo Piano, especially on the methodological aspects and the structural research developed by the young architect. Aspects and research that are the design foundations of the Centre Pompidou. Lorenzo Ciccarelli graduated in Building Engineering-Architecture in 2011 at the Università Politecnica delle Marche and at the Ecole d’Architecture de Paris-La Villette. In January 2016 he has been awarded with his Ph.D. in Architecture and Construction at the Università di Roma Tor Vergata with a thesis entitled Renzo Piano before Renzo Piano. The formative years 1958-1971. He is a specialist of Italian architecture of the twentieth century and its links with Europe and North America. Since 2013 he collaborates with the Renzo Piano Foundation in Genoa where he contributed to conceive and organize the recent Renzo Piano exhibitions in Padova, Genova and Paris. 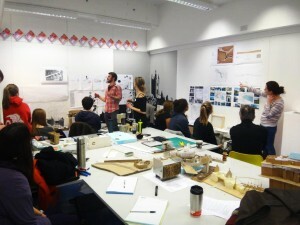 Dissertation is considered an important part of Stage 3; students have to choose a topic and explore it, either as an 8000 word essay, or as an Artefact, accompanied by a 4000 word essay. As I have loved films since a young age, it was obvious to me to choose something related to film-making. This gave me the possibility to study in depth the analogies between architecture and films and produce my own film. The fascination for Science-Fiction and my personal love for London, the biggest, and greatest, town on earth, gave me the idea for a short adventure taking place in London, in 2050. Mega-London is a Sci-Fi short-film, about a young boy, Mark, visiting London for the first time in 2050. The city, despite maintaining its British look, has changed its face. New, and gigantic skyscrapers decorate the skyline. Trees are planted wherever possible. The city’s new buses and trains look slick and futuristic. On his first day in the British capital, Mark will discover new places and the meeting with a femme fatale will change him. Bringing Mega-London to life was initially not an easy task. A film about London in the future was a pretentious project. My first intention was to film myself in London. Then, I would have incorporated the sequences with other scenes, where small sets and models would have simulated the new skyscrapers. However, I would have needed too many models and the budget became too high. 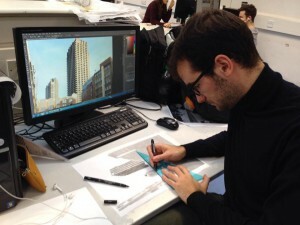 The second idea was CGI; programmes like 3DS Max and Photoshop make it possible to create some spectacular cityscapes. It was a shame to discover that the time needed to render is excessively long for even a single frame. After a screening, in the school, of the film Akira (my personal 6th vision of the film), as part of ‘Movie Mondays’ hosted by MA Architectural Visualisation students, it became clear to me that traditional animation could have been the key. Drawing is a skill every architect should be familiar with. With hand-drawing, you can create whatever you want; the only limit is your imagination. After a little research, I found Adobe After Effects to be the perfect programme to produce an animation. The decision was taken: Mega-London would have to be an animation film. Learning how to use the programme took roughly less than a week, thanks to the Adobe library and the YouTube tutorials. 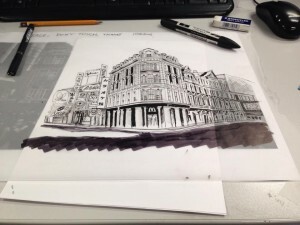 The drawings were made by tracing over my personal pictures of London. Then, I added new architecture, scanned the drawings, photoshopped them and placedthem on my sequence. 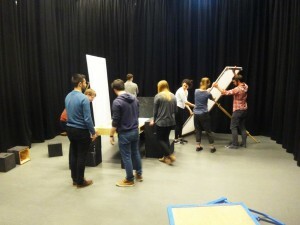 Making the entire film took almost four weeks. A very fun part was composing the music and recording my voice. As I wanted everything to be done by myself, music was no exception. After asking the Music Department for permission to use a music room, a synthesizer and some drums, I composed my own soundtrack, taking inspiration from great artists such as Vangelis, Giorgio Moroder, Tangerine Dream and Daft Punk. A friend of mine, Laurent, recorded everything with his laptop and microphone. Joseph Kosinski, director of TRON: Legacy and Oblivion, is an architect who became a film director and a great inspiration for my work. In an interview, he describes the analogy between a director and an architect to be the ability of communication. The architect can have a great vision for a building, but he will never be able to build it, unless he convinces other people that his idea is brilliant and worth the money. At the same time, a director must have a perfect vision too. His film must be engaging. This experience has definitely helped me enhancing both my computer skills and my communication skills. It was a tough and exciting challenge and I would do it again. To watch the full version of Marcello’s animation, click here. Photography is often considered a complementary field to architecture; the two areas inextricably linked through philosophy, theory and practice. The developments of both forms of art have grown and developed alongside each other. It is a poetic relationship that goes to the roots of photography. It is not coincidental that the first recorded photograph included a view of the form and space of and around architecture. An understanding of the processes of composition, framing and most essentially the control of light are inherent aspects of both disciplines. Through the module AR846: Architectural Photography, the MA Architectural Visualisation programme at the Kent School of Architecture develops students’ critical awareness of the architectural image, allowing them to apply this understanding to their digitally created imagery and visualisations. Studied during the autumn term, the architectural photography module provides students the opportunity to learn both traditional film and digital photographic techniques. The collection of images displayed here is the conclusion of this work. 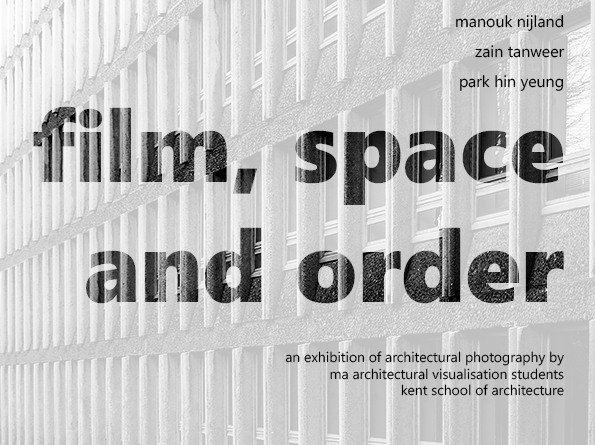 The MA Architectural Visualisation students’ work will be exhibited at The Gulbenkian from 08 February until 31 March 2016. Dr. Giridharan Renganathan has written a chapter on ‘Urban Climate Modelling: Challenges in the Tropics’ in the new book on Urban Climate Challenges in the Tropics, an area which has received little attention in the past. This chapter while highlighting the importance of climate modelling in the context of urban planning and design, presents both the energetics of urban tropics and its modelling. It also presents the readily available modelling options for tropics while discussing a fast changing area of research. In summary, the chapter deals with energy and mass exchange in urban areas, tropical climate and characteristics of urban morphology, modelling in the context of urban design, urban canopy layer modelling options, and parameterisation of critical urban variables for modelling.